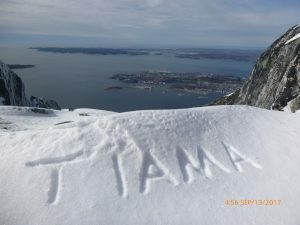 Tiama’s Great Adventure Update 5, The Home coming, Greenland to Amsterdam. Dear all. So yes, we made it back to Amsterdam, and here is the story. 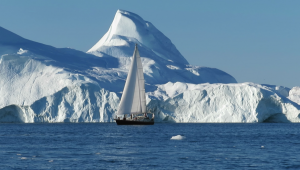 After the North West Passage we crossed Baffin Bay to Greenland, a 4 day passage, bit of wind, lots of icebergs and good visibility also with a full moon during the short nights helping us keep a good look out for the hard to see lumpy bits of ice called “Growlers “. The worn away multiyear lumps of hard ice just floating on the surface – it would not be a nice day if we hit one even with a steel boat. Greenland is just stunning, the saying “If you have travelled the world then there is always Greenland” has a lot of truth in it. A coast line of endless snow capped mountain chains interspersed with deep intricate deep fjords and glaciers, some of them huge ending right on the coast continually producing Castell size icebergs. 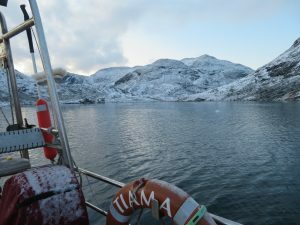 Our first night was spent deep inside a fiord around a hook of land created by a retreating glacier. We just looked around us in wonder. The mountains are “proper” mountains unlike most of the Canadian Arctic were the mountains are mostly crumbly and flat topped, worn away by many eons of freezing and thawing. Next to Ilulissat is a massive glacier, at times blocking the harbour entrance. We weaved our way through the channels created by the stranded icebergs. Tiama is in her element here. 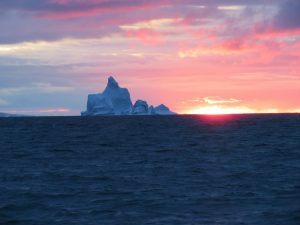 It is an ever changing landscape and some of the bergs are much taller then the boat, fascinating. 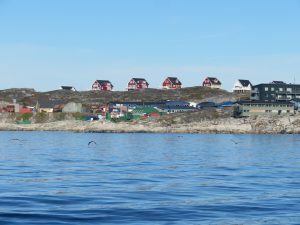 Greenland has a population of about 60,000. Officialdom does not want to know about visiting yachts. The police will only give an entry stamp in your passport if you go and visit them and then, only if you ask nicely. Clearing out of the country consists of calling the harbourmaster, and maybe he will ring Customs. It is a nice system. 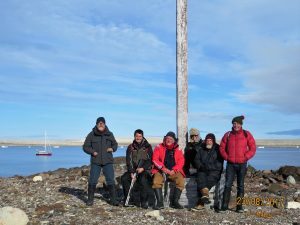 We sailed south down the west coast stopping in a few harbours waiting for a southerly blow to pass, catching some of the abundant fish for dinner at the anchorages. Then through the inside passage of Prins Christian Sound, avoiding Greenland’s Southern Cape, Kap Farvel, known for its fierce storms and opposing currents. At one stage I thought the weather forecast looked Ok and we left, but after a day at sea with an updated weather forecast I just could not see a way through. With the endless series of very deep low pressure weather systems, decided to turn back, a first for us. I don’t now the North Atlantic as well as the Southern Ocean but the forecasted weather systems scared the bejesus out of me. They just kept rolling up from the South West Atlantic fuelled by the hurricanes in the Caribbean then up the North American coast and crossing over towards the British coast and then at times curving back on them selves towards Iceland /Greenland and also with the occasional deep low coming down from Northern Canada curving around Kap Farvel. East Coast Greenland, Winter coming, time to head south. The East coast of Greenland is beset by ice traveling down from the North Pole for most of the year so you can only travel to some areas at the very end of the summer. 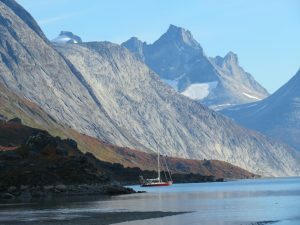 In certain sailing circles it is quite something to be able to say that you cruised some of the East Coast of Greenland. One gets brownie points for that. It did feel like hard country, unforgiving, best pay attention here, nobody else around. Some ways up that coast we found an amazing anchorage tucked right in, away from the constantly moving ice, and waited. One has to learn patience in these waters, not something that comes easy. Next favourable weather window we pressed on and made it to Reykjavik looking for places to overwinter the boat. We found a sheltered small harbour with nice people who were worried the boat would be damaged by their marina. I was more worried about the marina getting damaged by the boat. Tiama is a big girl and those piers looked awfully fragile next to her. There are only 90 registered sailboats in Iceland and most of them are in the 25 to 35-foot range. 3 days in town and we got a really favourable weather forecast, decided to leave first light next morning with only 3 crew remaining onboard. A 50% attrition rate in the crew department? 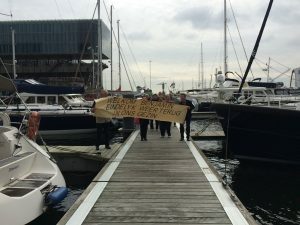 There again, most of us have been together for almost 5 months on a 15 meter yacht, not bad going really. After all the anticipation and preparing for heavy weather we managed to avoid the big weather systems across the North Atlantic and the North Sea, bits of sailing and a lots of motoring due to a lack of wind all the way to the Netherlands. The biggest threat to a peaceful nights sleep is the North Sea traffic. You can often count 14 offshore gas and oil platforms in a 5 mile radius, with associated ships traffic, throw in a few Traffic Separations schemes and offshore wind farms and it gets interesting, specially at night. Definitely worthwhile reading up on rules of the road at sea before you get there. Entering the harbour of Ijmuiden felt like we arrived, the end of the trip was near. In Amsterdam family and friends were waiting all of my 3 brothers and 3 sisters with partners and my god child Fiona were there, had to pinch myself that this was real and maybe wipe away a bit of water from the eye ducts. Welcome youngest one, finally back with the family. Auckland –Amsterdam 12000 Nautical Miles in 5 months via the Arctic Circle, with a good people onboard who appreciated it for what it was. Yes that is pretty real….. and Tiama, what a boat, behaving like it was just another day in the office. Phew weeeee. We are now in the Amsterdam Marina, close to Central Station, looking at winter maintenance work and occasionally sitting on the couch putting my feet by the fire. What next? 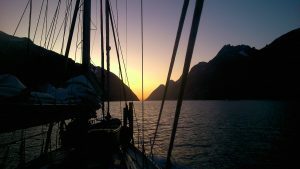 I’m having a wee think about next summer, nothing fixed yet but a rough plan is, sail from Amsterdam to Norway, Lofoten and further north to Spitsbergen and back to Amsterdam. So if your appetites are wetted by these tales of adventure on the high seas and among the ice then let me know and maybe we can work something out. You can see the route of our voyage by clicking on the heading “where is Tiama now”.